It appears as though we are getting our first look at the movie-based Hasbro Marvel Legends for next year’s ‘Captain Marvel’ film. There is a segment of the fanbase that watches early Amazon and other retailer’s listings very closely. It was noticed today (which happens to be the day before the Captain Marvel trailer should drop) that Amazon delisted four Captain Marvel movie Marvel Legends items. However, if they went into their browser history those listings now show pictures of the actual toys! This appears to have been discovered by a poster over at The Fwoosh forums, so all credit due to those maniacs and the insane amount of luck it took to catch that. Anyways, it looks as though the Kree Sentry that was revealed in Mexico will be the build-a-figure. It’s also entirely possible that Living Laser, Nighthawk, and Genis-Vell could fill the comic slots to make this a seven-figure wave. 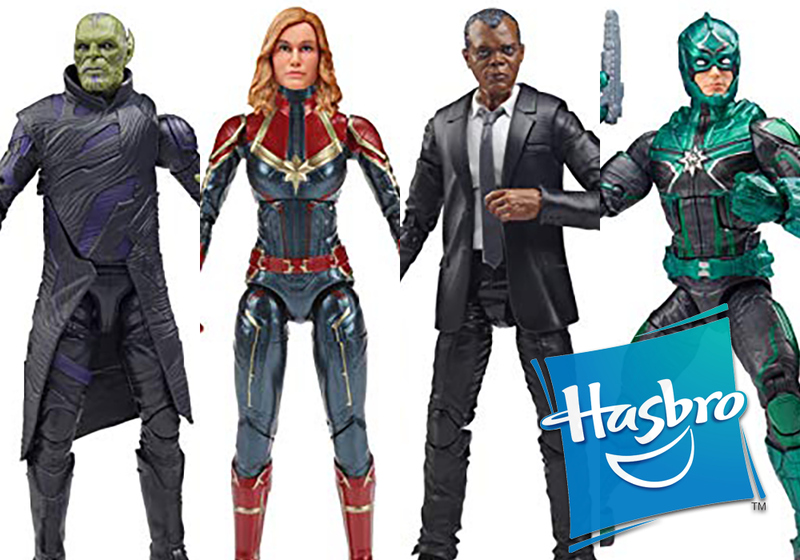 The new figures revealed are MCU Captain Marvel, MCU Skrull, MCU Nick Fury, and MCU Kree Soldier (possibly Mar-Vell?). I wouldn’t make too many assumptions about the quality of these figures from the pictures, they are upsized from very tiny Amazon thumbnails. It’s noted that Captain Marvel includes an additional head and hands. I would have to assume the head is with her helmet on. Nick Fury looks to be using the good old Coulson body but includes some yet-to-be-named accessories. Hopefully, we’ll get official confirmation and some higher resolution pictures of these new Marvel Legends reveals soon!